It's one of the most commonly asked questions about student loans in the UK - do you have repay your loan if you move abroad? In a nutshell, yes you do - but your repayments will no longer be automatic, and you'll have to put in the legwork so you don't get stung with charges (or worse) later. It can be a bit of a headache to work out so we've cut the jargon and gathered the facts for you. What happens to your student loan when you move abroad? What happens if you don't repay your student loan when abroad? If you're moving overseas for longer than three months then you need to contact the Student Loans Company (SLC) to sort out your student loan repayments. While you're living in the UK, you don't really need to think about your student loan repayments, as HMRC takes the money automatically from your paycheck each month before you even see it - and gives it straight to the SLC. Once you move abroad, HMRC is no longer in control, and it's up to you to tell the SLC how much you're earning and provide evidence for that. They'll set your repayment schedule accordingly. It's not too difficult to organise either, you just need to make sure you're able to get your hands on the right paperwork. You can tell the SLC about your living situation and how much you're earning through an Overseas Income Assessment Form (OVFA) which you download from the SLC website. You'll have to return the form with evidence which proves how much you're earning, or where your money is coming from. You only start repaying your student loan when you're earning a certain amount of money - so you won't need to repay anything if you're studying, volunteering, travelling or unemployed, for example. However, you will still need to provide evidence of this. Supported by someone else - They must fill in the Third Party Declaration part of the form and you must provide your bank statement. Essentially you'll be repaying exactly the same as you would be if you were still in the UK. It's just a little bit more complicated to work out what that should be. Here's the low-down on repayments for both Plan 1 and Plan 2 loans. 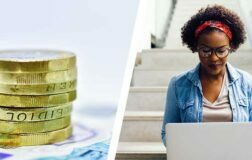 Don't forget to check out our Big Fat Guide to Student Finance for all the ins and outs of how much you'll owe. You'll have a Plan 2 loan if you started uni since 2012 in England and Wales. Living in the UK, you would pay back 9% of anything you earn over £25,725 a year - you can see the full breakdown in our guide to student loan repayments. The exact same happens when you're living abroad. The SLC essentially works out what the equivalent repayment threshold is in your new country of residence, taking into account a range of factors such as the cost of living and average salaries. For example, if you lived in China, you would pay back 9% of everything you earn over £15,000 (or the equivalent in China's currency, Renminbi). The SLC have a full list of countries and the equivalent repayment thresholds on their website here - the lower income threshold marks the point when you start repaying your loan. Interest rates are applied in the exact same way as they would be if you lived in the UK. Your loan currently gains interest at RPI until you hit the lower income threshold of £25,725, from which point an extra percentage is added based on your income. When you hit the upper-income threshold of £46,305, interest is capped at RPI +3%. You can use the SLC table to view the upper and lower income threshold for each country, which will determine the level of interest you'll receive based on your earnings. You'll also notice a column titled Fixed Monthly Repayment - this is how much you'll be asked to repay if you fail to notify the SLC how much you're earning. Be careful with this, as if you don't keep the SLC up to date while you're away, you'll be stung with these payments when they catch up with you. You'll be on the Plan 1 loan if you started uni between 1998 and 2012 in England and Wales, or since 1998 in Scotland or Northern Ireland. Just like with Plan 2 loans, the amount you repay while living abroad will be exactly the same as you would pay in the UK, but converted into the equivalent amount of money for the country you're living in. For a Plan 1 loan in the UK, you currently pay back 9% of what you earn over £18,935 a year. So when you're abroad you'll pay 9% of whatever you earn over the equivalent repayment threshold for that country. Therefore, if you lived in Australia, you would repay 9% of everything you earn over £21,995 (or the equivalent in Australian dollars). You can find a list of the Plan 1 repayment thresholds for each country on the SLC website here. You'll also notice the Fixed Monthly Repayment, which shows the amount you'll be asked to pay if you fail to inform the SLC of your actual income. When the SLC decide how much you need to repay, they'll schedule your payments for 12 months. However, if your circumstances change, for example your annual pay drops to below the repayment threshold or you become unemployed, you simply need to apply for a reassessment. Don't pay money when you don't have to, and if you overpay, make sure you apply for a refund. Since your debt will be wiped after 30 years, you should try to keep a hold of every penny you can. Use our student loan repayment calculator to work out how much you're likely to repay before the debt is wiped. It's a common myth that you can just jet off to another country and leave all your loan troubles behind. However, the British government are taking stricter measures to catch up with graduates who aren't paying back their student debt - whatever country they're in. Better data sharing between countries is making this easier and more effective, and the consequences can be pretty serious. The government are starting to refer defaulting students to credit agencies, implement sanctions and in some cases even prosecute. While this might seem like a distant threat when you're in another corner of the world, it will catch up with you eventually - especially if you ever return to the UK. Basically, it's not worth the risk. This is just one of many myths about student loans - make sure you don't fall for any of the others! Any other questions about repaying your loan from abroad? Let us know in the comments.